Cash's Blog | Cash's report to the world! 上次寫了一篇 HDCP 相容性的筆記, 引起一些網友發問. 最近又浮出 Miracast 的客戶, 只好再研究一下, 順便拋磚引玉. HDCP 分為應用於 on HDMI 以及應用於 Interface Independent (AV stream) 兩個狀況. 兩者最顯著的差異, 我認為是 encryption 就不同. 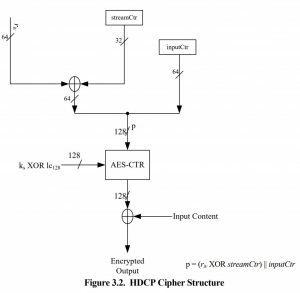 HDMI 的 HDCP cipher 在 section 3.0 HDCP encryption 中的 3.2. AV stream 在 section 3.4 中描述的 HDCP cipher 則如下. 兩張圖雖然都是 Figure 3.2, 但 AV stream 輸入的會以 32 bit 的 stream counter 和 64 bit 輸入的 LSB 做 XOR. HDCP TX 會針對每一個 PES 指定一個 32 bit 的 stream counter. 當然每個節目 (program) 的 stream counter 也會不一樣. 這樣切台時, 就要重新算一次新的值, 而不能跨台共用. 接下來關心 V2.3 和 V2.2 的差異. 在 Interface Independent 的部分. V2.3 的規格書比 V2.2 多了一個 appendix 的 test vector 章節, 官網還特別放了 HDCP independent (for AV stream) 和 over HDMI 兩種 test vector 相容性測試文件. 除此之外, 最大的差異反映在 revoke 的能力, 其它的差異不大. 因此有家 Inside Secure 宣稱可以提供軟體升級 HDCP V2.3 . 所謂的 revoke 是說, upstream device (HDMI TX) “may” 對 downstream device (HDMI RX) 做 revoke list 的檢查. 如果這個 HDMI RX 是一個 repeater, 後面還接著一堆 HDMI device, 那麼它們的 receiver ID 也都在被檢查之列. 如果 receiver ID 出現在黑名單, 那 HDCP 的 authentication 就算失敗. 基於這一點, V2.3 的 page 42 最前面還多了一段描述, 特別指出拔掉已經驗證過 HDCP receiver 也會觸發 RxStatus 變成不 ready. 第二大的差異是 HDCP V2.2 只提它和 HDCP2_0 的相容性, 這暗示 HDCP V2.2 和 V2.1 比較相容. 但 HDCP V2.3 常用 HDCP2_LEGACY 概括描述先前版本, 或者同時提到 V2.2 和 V2.1. 最後有個微小的差異是, V2.3 當中, 有 18 處提到 TMDS (傳輸最小化差分訊號) 這個名詞, 而 V2.2 當中只提到 4 次 TMDS, 多出的這 14 個地方是用來釐清: TMDS 訊號未必都是 video pixel. 至於 HDCP V2.2 和 V2.3 都各自出現了 13 次 T.M.D.S. 沒有句點的 TMDS 是指訊號, T.M.D.S 是指這個技術, 常出現在方塊圖. (1) 特別提到 audio 要參照 Exhibit C section 3.3.1. (2) Page 39 的 Figure 2.16 的說明改了. 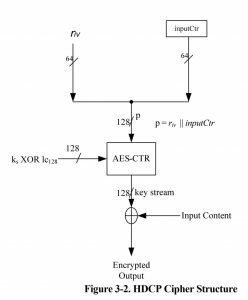 State C0: Unauthenticated 多了一個 upstream side de-assert HDCP_HPD 的選項. 原本 State C0 就是 receiver 在等著進到 authentication 而已.